McLaren. The name conjures images of bellowing Orange Can Am racers, delicately sculpted Formula 1 racers and fabulous road cars like this breathtaking 2014 P1 Hybrid. Boasting chassis number 2, this McLaren P1 was the earliest serial number available to the public and – since McLaren kept serial number 1 – this McLaren P1 is the earliest chassis number in private hands today. 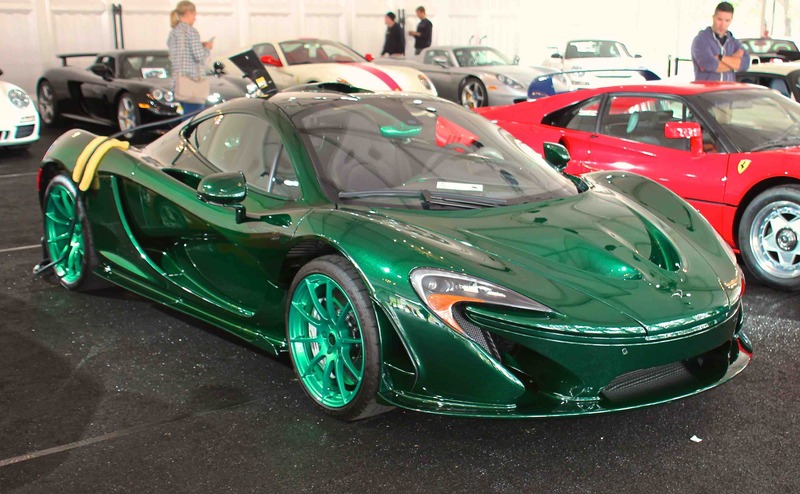 A one-owner jewel, the supercar was delivered new in May 2014 with a painted carbon fiber body. Later in the production cycle, McLaren announced their plans to offer a limited number of cars with exposed carbon fiber body panels. The owner shipped the car back to McLaren in September 2015 to be fitted with an exposed carbon-fiber body and upon completion, McLaren shipped the completed car back in December 2015 and then later the original painted body in three separate crates. McLaren built only four or five exposed carbon fiber cars after the end of the original production run, however this P1 is the only example that was converted from a painted to exposed-finished body by the factory. The original body will be included in the sale of the car with complimentary shipping to a location within the continental United States. The McLaren P1 demonstrates that the supercar concept has advanced exponentially in the last decade. More than just a freakish powertrain wrapped in wads of carbon fiber, the P1 is an exquisitely rendered system of systems. Its aero design imparts more downforce than any other production road car in the world. It supplements that with a combination of RaceActive Chassis Control and an adjustable rear wing to add ground effect aerodynamics and maximize the downforce inherent in the car’s sculpting. Its revolutionary MonoCage monocoque, one of the lightest such structures of any road car at just 180 pounds, is composed of carbon fiber with five times the strength of titanium and incorporates the additional protection of Kevlar. McLaren designers and engineers simultaneously drew on both the past and the future of Formula 1 for the P1, employing such outlawed technologies as the aforementioned active aerodynamics and suspension while previewing the change to hybrid powertrains introduced in the 2014 rulebook. In addition to its all-carbon-fiber construction (McLaren pioneered its use in Formula 1), the P1 incorporates many present-day Formula 1 technologies, including IPAS (Instant Power Assist System), a development of KERS (Kinetic Energy Recovery System) that instantly delivers maximum power, and DRS (Drag Reduction System), which adjusts the rear spoiler to maximize straight-line speed, all at the touch of steering wheel-mounted buttons. Power is wrought through a combination of a twin-turbocharged 3.8L DOHC 32-valve V-8 rated at 727 HP and, in the 7-speed dual-clutch transmission, a permanent-magnet synchronous electric motor adding 177 HP for a total output of 903 HP and more than 700 lb-ft of torque. Mounted amidships and fed by a roof-mounted snorkel air intake inspired by the McLaren F1 road car, this power package blasts the P1 to 60 MPH in 2.7 seconds, 100 MPH in 5.1 and 185 MPH in just 16.5 seconds, the latter 5 fewer than the McLaren F1. The F1’s exotic silicon-carbide-coated carbon-ceramic disc brakes, supplied by Formula 1 partners Akebono, halt the P1 from 120 MPH in a mere 380 feet. Drivers can choose from several modes of performance, beginning with E-mode, which uses only the electric motor and the most docile suspension setting. Things start happening fast from there, drawing the driver into ever-more intimate contact with the P1 that climaxes in full-on Race mode. It is there that the P1 is truly in its element, delivering its pilot into the nirvana of car and driver operating as one. The RaceActive system hunkers the car down two inches closer to the ground, inducing full ground effect, and the wind-sculpted rear spoiler ascends almost a foot from its enclave to generate more than 1,300 pounds of downforce at 160 MPH, the key to the P1 driving experience at its outer limits. Power delivery is seamless and unrelenting thanks to the interplay between the two power sources; acceleration, braking and cornering are forays into new and wonderful gravitational realms, all performed to the visceral, unfiltered soundtrack of that shrieking twin-turbo V-8. At rest, the P1 is a study in the laws of airflow wrought in complex beauty and fine detail. Like a handcrafted timepiece that shows off its intricate movement through glass, P1 number 2’s carbon-fiber surfaces are tinted rather than painted, exposing the artfully hand-laid woven material through a glass-like coating of green lacquer. The effect is appropriately stunning on a car whose beauty—in even the most pedestrian color—arrests onlookers as if suddenly locked in suspended animation. 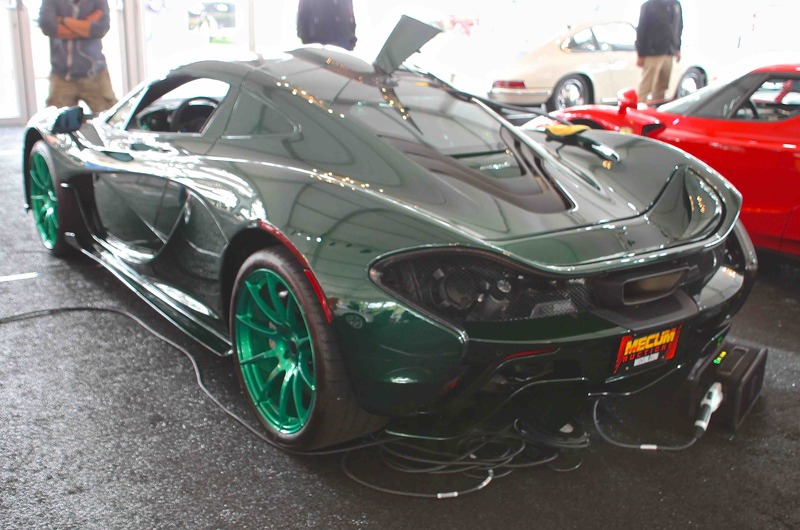 Green metallic lacquer ties the Pirelli P-Zero-shod 19-inch front and 20-inch rear wheels to the overall scheme, which repeats inside with green carbon-fiber accents and stitching on the black leather upholstery. The P1’s racing-style seats and focused controls are typical of McLaren’s driver-centric design philosophy, which also makes room for such conveniences as climate control, navigation, carpeting and an exclusive Meridian sound system. Did you know we insure exotic cars? If you have an exotic or another collectible you’d like to insure with us, let us show you how we are more than just another collector vehicle insurance company. We want to protect your passion! Click below for an online quote, or give us a call at 800.678.5173.